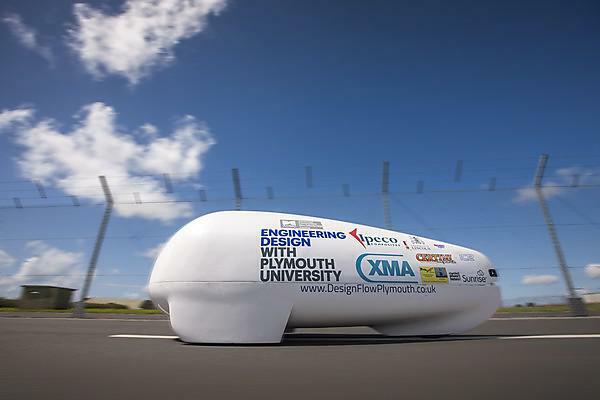 A vehicle designed to enter the record books later this year has been tested for the first time under the watchful eye of experts from University of Plymouth. Mechanical and composites engineers and students have been developing a Human Powered Vehicle (HPV), which they hope will set a new arm-powered speed record in the Nevada desert in September. Piloted and powered by paracyclist Liz McTernan, it needs to travel in excess of 21.39 miles per hour over a 200 metre stretch of tarmac in order to beat the current women’s benchmark. The project has so far involved months of design and building work at the University, but the first detailed tests were held over two days earlier this month. After a day of testing in the lab, the team moved to Smeatharpe Airfield in Devon where they embarked on the first tests with Liz at the controls to explore the vehicle’s full potential. Handcycling is growing in popularity and annual speed trials for a range of HPVs are held on the long straight roads of Battle Mountain, Nevada, where competitors can build up speed over a five mile run-up before being measured over a 200m stretch. The University of Plymouth team behind the record bid led by Adam Kyte, Lecturer in Mechanical and Marine Engineering Design, working with students Matthew Sharman (MEng Mechanical Engineering) and Rhys Parsons (BEng Mechanical Engineering with Composites). The frame of the handcycle has been constructed from aluminium, with the help of University technicians Julian Seipp, Rick Preston and Neil Fewings, and the team are now building the aerodynamic shell from an advanced composite material. Many of the components have been sourced and supplied by the Saltash-based Certini Bicycle Company, with the vehicle also using a ProShift Automatic Gear Shifting Controller provided via a sponsorship from Baron Controls LLC, Sugar Land Texas, USA.